Do you ever wonder how officials decide who is at fault in an accident when there are no witnesses? The answer is math. The Royal Canadian Mounted Police (RCMP) use math in many ways, not only while analyzing accidents, but also while on patrol. Math is used in forensics as well and members of the RCMP work with engineers and other specialists to find clues at a crime scene. Then, they can use problem-solving skills to draw up a variety of possibilities. As more clues unfold, they can eliminate possibilities, coming to a final conclusion that can be used as evidence in court. 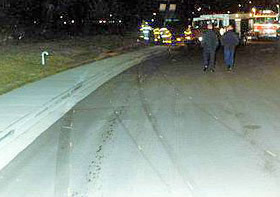 One of the specialty areas of the RCMP is accident reconstruction. These people analyze traffic accidents to determine the cause of an accident and the causes of any injuries that people sustained. It is also their job to decide whether or not the accident was preventable. To do this, they need to have a very acute sense of mathematics. S is the speed of the vehicle, d is the distance of the skid marks, and f is the coefficient of friction. Measuring the distance of skid marks is a fairly routine procedure and can be done relatively easily, but it is a little more difficult to find the coefficient of friction. The f is the measurement of force (the coefficient of friction), the F is the force of gravity coming down on the tires, and W is the weight of the tire. In order to find the force of gravity (sometimes referred to as the drag factor), specialists actually drag one of the weighed tires along the roadway to determine the force. They will drag the tire maybe twenty times and take the average force measurement. To actually find the measurement of the drag factor requires a number of complex formulas and some special equipment. In order to use this formula for measuring skid marks, the skids have to be in straight lines. S is the speed of the vehicle before impact, f is the coefficient of friction, e is the elevation of the road, and R is the radius of the yaw mark. The radius is determined by finding the centre of mass of one of the tires, which acts as the centre of the circle. This formula, one of many more complex formulas involved in this problem, utilizes the understanding of linear momentum as the vehicle spins out of control. Because of the Law of Conservation of Momentum, energy is neither created nor destroyed. Thus, if specialists know the angles that the incoming vehicles collided at and the weight of the vehicles, they can determine the speeds of the vehicles. Equations are also used to find speeds of vehicles using other information, aside from skid and yaw marks. If a pedestrian is hit, or a vehicle rolls, speeds can be determined by analyzing the movement of the pedestrian and vehicle. If a vehicle or pedestrian vaults, flips, or falls, these differences can help determine the speed of the traveling vehicle. Again, specialists use a number of complicated equations to find an exact speed. After an accident happens, officials can use math to decide who was driving the vehicle, even if the driver was not wearing a seatbelt, by looking at where the victims landed and then measuring and figuring out angles. There is only one solution. This uniqueness also applies to crime scene investigation. Sometimes, RCMP officers and other specialist will need to analyze fingerprints or shoe prints. DNA is not as effective because identical twins have the same DNA, but different fingerprints. When experts analyze fingerprints, they are looking for patterns. They look for particular ridges and use special tools to find tiny edges or pores on a ridge of a fingerprint. Similarly with shoeprints, specialists want to find what makes a particular shoe print unique. Maybe there is a break in the sole pattern that makes that specific shoeprint different from any other shoeprint from a similar shoe. In math we recognize uniqueness as a single solution. There is only one unique solution. This is similar to working with fingerprints. When analyzing a set of fingerprints, they either match, or they don’t. RCMP officers also use math while on patrol. The legal drinking limit for an adult that is still able to drive is a blood alcohol content (BAC) of .08. That is, any measurement higher than that makes driving illegal, and drivers can be charged or fined. The measurement of .08 means .08 grams of alcohol per 100mL of blood. The mouth absorbs alcohol, so the alcohol on the driver’s breath is related to the amount of alcohol in their blood. The ratio of breath alcohol to blood alcohol is 2100 to 1 (this ratio can vary slightly depending on the individual). This means that the alcohol content of 2100 milliliters of exhaled air is the same as the amount of alcohol in 1 milliliter of blood. Alcohol is then expressed as a percentage amount in the blood, where the legal limit is .08%. RCMP officers use a breath test called a Breathalyzer to determine the BAC of a driver they suspect may have been drinking. And although the Breathalyzer does most of the math, it is important to understand how it works and the math behind it. RCMP officers also use math when writing tickets. Let’s look at speeding tickets as an example. In the province of Saskatchewan, speeding tickets can be expressed as linear equations. That is, the faster a person drives (in excess of the posted speed limit), the more their ticket will be if they get caught. If the vehicle is traveling 0 – 30 km/h over the posted limit, the fine is $70 plus $1 for every km/h over the limit. There is also a Victim Surcharge of $30 if the total cost of the ticket is less than $100. So, let’s say the posted limit is 110 km/h and a vehicle is traveling 125 km/h. If the driver were to get caught, finding the cost of the ticket would require some mathematical calculations. First of all, 125 km/h is 15km/h over the limit. The base ticket rate is $70, plus $1 for each km/h over ($15). This brings the total amount of the ticket to $85. Since this is less than $100, the Victim Surcharge would be applied, summing up the total fine to $115. RCMP officers need to do this math quickly, while the driver waits patiently in their car. They also need to be very accurate. The above rate is not the only rate officers need to know. If a vehicle is traveling 31 – 50 km/h over the limit, the fine is $70 plus $2 for every km/h over the posted limit. There is also a $40 Victim Surcharge, regardless of the total amount of the ticket. If a vehicle is traveling 51+ km/h over the speed limit, then the fine is $140 plus $4 for every km/h over the limit. There is also a Victim Surcharge of $40 (if the ticket is less than $200) or $50 (if the ticket is more than $200). RCMP officials use math everyday. They use many complex equations and do a lot of problem solving. The equations discussed previously may not seem that difficult, but they are used in conjunction with a number of other complex and advanced formulas. It is important for the Police officers to know which formula is used for what and how to apply them, as well as to figure out values for the variables. Police officers are trained to use mathematics in their field and can take extended training to work in Forensics or Accident Reconstruction. The television program NUMB3RS exemplifies more math in crime scene investigation. There are acitivities to follow that coincincide with episodes of the show. Visit the website for more details. For more information, you may want to ask your local RCMP detachment. Corporal Bob Findlay of the Morse RCMP Detachment, who is a Level 4 Accident Reconstructionist, for all of his help and expertise. Also, thank you to Dave Chu of the Surrey RCMP for his help.